Oh, look. Another found footage horror flick. What is going on? Are these things breeding? Seriously, something has to be done about this or filmmakers are going to stop making horror films that look like, you know, actual movies. This is a bit of an unfair gripe in regards to Apartment 143, a Spanish film (although starring Americans, speaking English) written by Rodrigo Cortes and directed by Carles Torrens. All the hallmarks of found footage horror are there. Shaky cameras, some improvised dialogue, and most importantly, a whole pile of low-budget filmmaking shortcuts. But, the nature of the footage taken by the characters isn’t technically ‘found,’ nor is it faux documentary. It exists in an in-between state that I don’t believe has a name. Let’s call it Graduate Assistant Potpourri. The eponymous apartment of the title is an evil place. Tucked into a nowhere corner in a nowhere building in the greater Los Angeles area, the windows are old, the kitchen is too small, and the wallpaper is horrendous. Really, I don’t understand how someone could live there. It looks like it hasn’t been renovated since the late 1960s. As if that weren’t bad enough, the joint is also haunted. Alan White (Kai Lennox) and his two children, four-year-old Benny (Damian Roman) and a teenaged daughter with a short fuse, Caitlin (Gia Mantegna), live there. Before the events of the film, Alan’s wife, and the children’s mother, died. Not long after that, ghostly events begin plaguing the White family, forcing them to leave their home and move into their ugly apartment. Unfortunately for them, that did nothing to stop the disturbances. At wit’s end, Alan reached out to a local university psychologist, Dr. Helzer (Michael O’Keefe), who then gathered up his grad students to head to the apartment and investigate. All of this is backstory. The film begins with the team, consisting of the good doctor and students Ellen and Paul (Fiona Glascott and Rick Gonzalez), setting up cameras around the apartment to capture any action. Let me clarify somewhat. The team set up LOW-fidelity cameras. There’s more grit and grain to this film than someone can find at the beach. Torrens doesn’t waste a lot of time getting the story moving. The team is in the apartment for about five minutes before the shenanigans start. There is also no wasted time in the form of ambiguity. The characters are clued in from the start that there are no normal, physical causes to the banging in the walls or stuff sliding around the apartment. It only remains to determine the cause, which turns out to be far from typical ghostly boilerplate (but no spoilers, here). The time in between initial events and resolution is spent trying to scare the bejesus out of the viewer. And Apartment 143 does a pretty good job doing so. It’s no secret here at Missile Test that ghost flicks are my favorite subgenre of horror. Out of all the methods filmmakers employ to soil a viewer’s shorts, none, to me, are as effective as a really creepy haunted house. Disembodied voices, mysterious noises, the idea of a restless spirit...oh, yeah. That’s the stuff. But, unlike most other horror films, ghost flicks tend to lose steam about halfway through, when the audience either becomes accustomed to the scares, or those scares ratchet up the visuals to the point that they are no longer scary. It’s the opposite of a slasher flick, where the climaxes tend to be the most frenetic and stressful parts of the films. In a ghost flick, the most tension and creepiness usually occurs upfront. 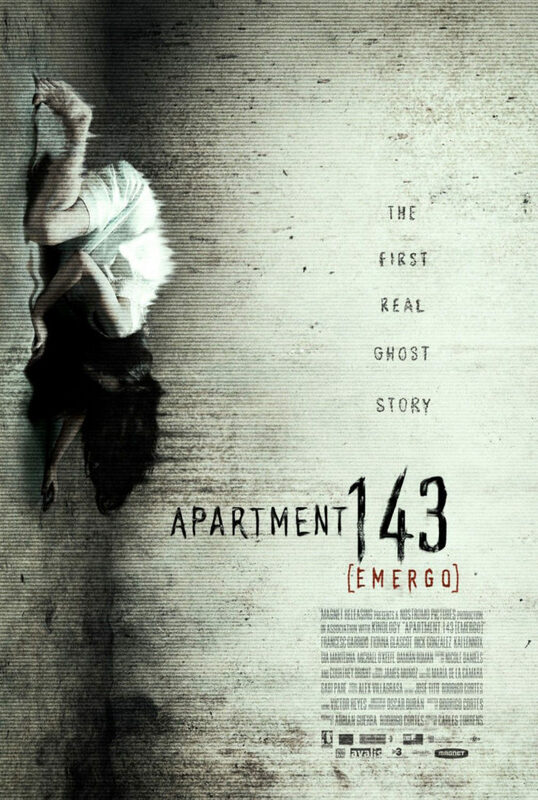 Consequently, a ghost film that can maintain its scary throughout is a rare treat, and Apartment 143 does just that. It never goes too far and never pulls back too much. Unlike other films where the ghost starts small and builds up inexplicably (why would a ghost need to start small, really? ), in this movie, the presence of the research team seems to be antagonizing the entity, goading it into more powerful displays. It is here that some of the low-budget trickery comes into play. This film is practically devoid of CGI (thank goodness), so most of the parlor tricks require a less than steady camera to work, aiding the crew’s efforts to work without their methods being picked up by the audience. The technique can be a little distracting, but at least the scares dreamed up by Torrens and his people are decent. This film was a miss with a lot of viewers, and I can understand why. Found footage has got to go, but this is one of the rare instances where I think it’s justified by the plot. It was used well, with just about everything that occurred on camera something that a team investigating a ghost would actually record, I imagine. The cast was good all around, and the screenplay only made some minor forays into cliché. More than anything, though, I liked this movie because the scary stuff in the third act was just as frightening as the scary stuff in the first.